Most kids and volunteers love VBS crafts and snacks—some more than others. While Splash Canyon will have plenty of fun crafts and tasty treat ideas for kids in 2018, it’s always good to have a few options on hand. We’ve listed some tips for finding the best craft and snack ideas on social media. Happy browsing! Pinterest is at the top of the list when it comes to locating simple ideas for VBS crafts and snacks. This highly visual site utilizes step-by-step directions, including easy do-it-yourself (DIY) crafts and snacks. Check out the Splash Canyon Pinterest Board for a look at all of our craft and snack ideas for next year. Broaden your search by using these terms on Pinterest. If you don’t have a Pinterest account, Instagram is a great alternative for VBS crafts and snacks. In addition to ideas on Concordia Publishing House’s VBS account, @cph_vbs, try searching the hashtags #vbscrafts or #kidscrafts for a bunch of neat crafting concepts. For snacks, #vbssnacks and #kidsnacks will be helpful. Reach out to others for inspiration on Facebook. You’ll find collaborative groups where members can easily share photos and ideas back and forth. You can create your own group or join a closed group that’s already been established. To find these groups, just type what you’re looking for in the search bar. You’ll always find great connections and ideas on our Facebook page too. Finally, don’t forget to socially network in person! 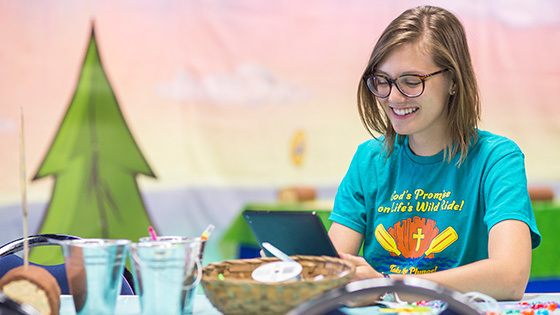 Ask other children’s ministry leaders and parents about the snacks and crafts that have worked for them and you may just find a few extra VBS volunteers along the way! We hope that these ideas are useful in your quest to find the right crafts and snacks for your VBS.